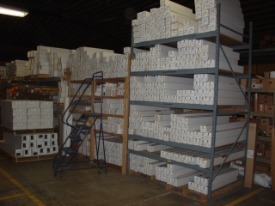 We keep our 8,000 square foot warehouse stocked with a wide array of medias for your large format printers and copiers. Standard monochrome bond to specialty banner materials are in our warehouse now so you don't have to wait to finish your final project. Our Media Specialist can help you find the media that best fits your need. Give us a call today! These 3 inch core rolls range from 18 inches to 42 inches wide and are 500 feet long for your large format copier. This paper is also available in cut sheet sizes, 18 x 24, 24 x 36 and 30 x 42. This 20 lb plotter bond is designed for your large format black and white drawings. It is available in widths ranging from 18 inch to 42 inch rolls with a 2 inch core. The rolls come 150 feet or 300 feet in length. This premium plotter bond has a special coating to accept your full color prints. It is only available in 2 inch core rolls and the widths range from 24 inches to 42 inches. It is available in 150 foot or 300 foot rolls. These universal photographic papers are designed for your large format photos. The rolls are produced in high gloss or matte finishes. Available in 24 inch to 60 inch roll widths. Finish your presentation off right with this heavy weight coated presentation paper. It is available in 24 to 60 inch widths and have 2 inch cores. You now have the ability to print your own banners. The banner materials range from a scrim vinyl to a wet strength paper. Produced in 24 to 60 inch width rolls. Our plotter films range from a clear acetate used for overlays to backlit films for displays. Print your next sign on this adhesive backed vinyl. With a repositional adhesive you can print one sign and hang it without the fear of having to get it "right" the first time. Available in rolls ranging from 24 to 60 inches wide. There is also an array of fabrics that are available to you to fit your printing need. Reproduce your oil painting on one of our canvas papers for a more authentic look. For a complete list of available media and ICC profiles for Aqueous, Latex, Eco-Solvent and Solvent printers please visit www.magicinkjet.com.